On Sunday January 13, 2019, the 42nd Annual Tonawandas Youth Team Tournament was held at Tonawanda bowling Center in Tonawanda, NY. Twentyeight teams competed in two divisions based on total team average for scratch and handicap titles. In the A division, the scratch title went to team "Fireball". The Team consisted of Josh Large, Michael Weber, Dominic Germano, and Ryan Reese. The foursome's scratch total of 2663 was led by Michael Weber's 700 set and Josh Large's 277 first game. The first place with handicap title went to team "Livin' on a Spare" (Tyler Wells, Skyler Randall, Lorissa Farrell and Melissa Large) with a 3016 handicap set. They were followed by the "Brandt's Best" (2932) - Peyton Anderson, David Adams, Cameron Kreger, and Megan Adams. Third place went to team "Classic Strikers" (2877) - Joseph Colson, Rebekah Colson, Derek Gottler, and Peter Gottler. In the B division, team "Transit E-Bowl-A" took the scratch title. Charles Buttery, Andrew Govenettio, Jacob Racsumberger, and Lane Marlatt rolled a total of 1996 to take the title. The first place with handicap title went to "#1 9am Preps" (Jacob Richards, Dylan Carpenter, Christian McDonald, and Riley Berg) who combined for a total of 2896. Second place with handicap went to "Team Pusatier" who totaled 2813. The team was comprised of Callen Neeson, Josh McMahon, Josh Mallabar, and Nicholas Pusatier. Third place with handicap went to "Total Pins" who totaled 2803. Their team was comprised of Dominic Eckrote, Michael Abendschein, Noah Burgio, and Jonathan Kramer. Scores of Note: David Adams (290, 243, 701) had high game and high set of the tournament; Michael Weber (226, 268, 206, 700), Nicholas Brady (235, 218, 246, 699), Joshua Large (277, 204, 674), Thomas Klenke (202, 236, 231, 669), Dominic Germano (233, 214, 204, 651), Ryan Reese (258, 638), Makenzie Yesis (203, 241, 630), Tyler Wells (250, 208, 626) Melissa Large (221, 211, 614), Cameron Kreger (219, 606), Joseph Colson (247, 605), Rebekah Colson (215), Sydney Skimmer (204), Andrew Damiani (204, 235), Chloe Strong (227), Lane Marlatt (212), Stephen Palmeri (208), Callen Neeson (208), Jacob Willard (204), Joshua Henderson (203). 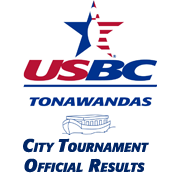 For more information from the Tonawandas USBC association including upcoming events, tournaments, and entry forms please visit www.tonusbc.com, or call the Association office at (716) 692-8668.